Barefoot College, the Indian Embassy and Wadah Foundation sponsored eight grandmothers from Eastern Indonesia to be trained on Solar Electrification in Tilonia, Rajasthan, India for six months. There, they were joined by 27 other grandmothers from other countries from 14 September 2013 to 14 March 2014. These eight grandmothers, also called as "grandmamas" - Agnes Dalima, Indo Intan, Domingas De Jesus, Hanafia , Adelfina Maria, Maria Karolina, Olandina Ranggel and Rasmi - all came from East Nusa Tenggara (NTT). After an intensive six-month training, on March 16, all 8 grandmamas returned back to Indonesia equipped with new skills such as assembling, installing and repairing solar panels and lanterns. The return and arrival of the grandmamas brought much happiness and pride to everyone involved especially to Wadah Foundation which actively supported the program. Before heading back to NTT , Wadah Titian Harapan Foundation, in cooperation with the Embassy of India in Jakarta, held a press conference at the Indian Embassy in Jakarta on March 18, 2014 by presenting the eight grandmamas. 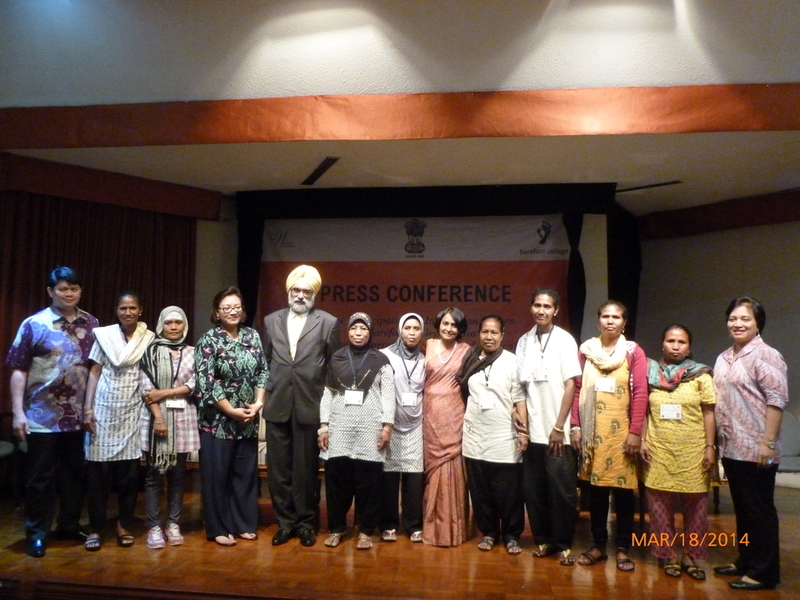 At the press conference, His Excellency Indian Ambassador Gurjit Singh expounded the cooperation between Wadah Foundation, Barefoot College and the Government of India through the Indian Technical Education Cooperation or ITEC Program. Mrs. Anie Djojohadikusumo, on her part as Wadah Foundation’s Patron, expressed her profound thanks to Barefoot College and the Indian Government for the great opportunity that was given to the eight women and the their respective villages for providing them better hope for the future. Everyone in attendance was impressed when the grandmamas made a brief demonstration of the solar lantern that they assembled. Considering that all participants were either illiterate or semi-illiterate, this did not deter them from pushing themselves to learn and understand what was instructed to them to be able to assemble, install and repair solar panels and lanterns. Also present during the press conference were the wife of Indian Ambassador Mrs. Neeru Singh, officers and staff of the Indian Embassy as well as the Board of Advisers and Executives of Wadah Foundation.